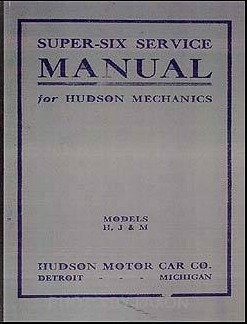 296 pages of Hudson information from 1909 to 1957. Thank You Alex! 1913 Instruction Book - Hudson "37"
1920 Hudson-Essex Service Station Tools and Shop Equipment - This is really neat stuff. 1924 Weaver Garage Tools for Hudson and Essex. 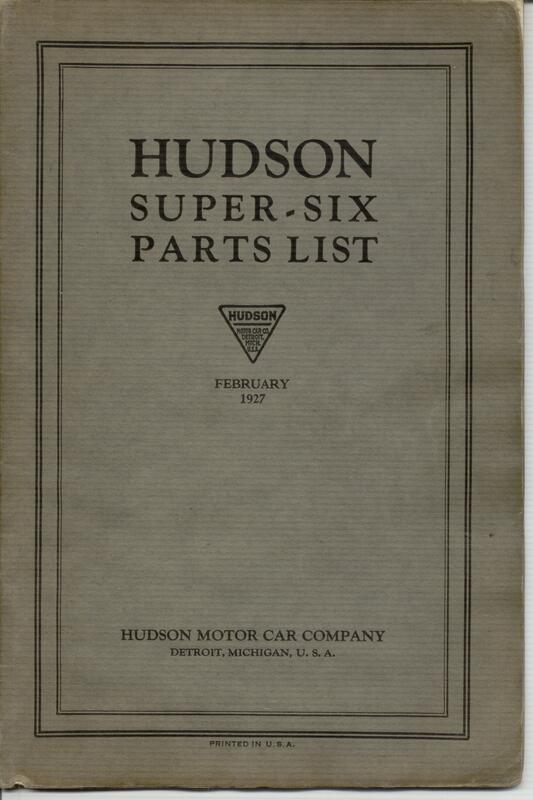 1924 Hutto Garage Tools for Hudson and Essex. 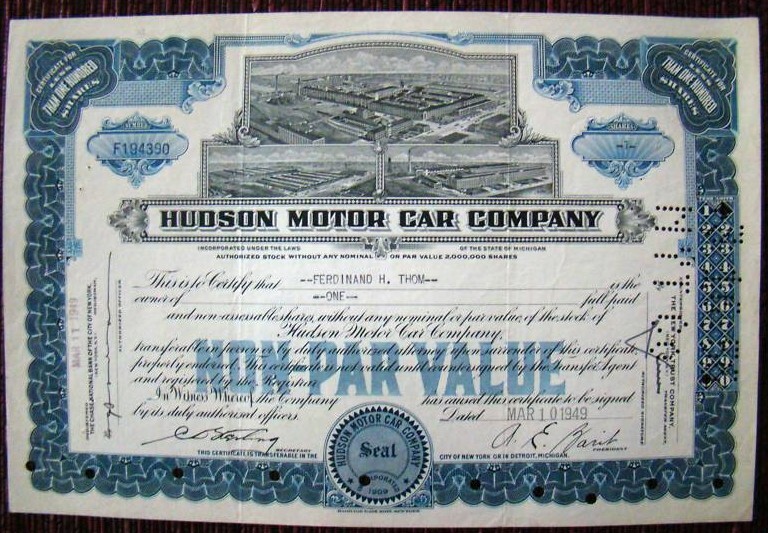 1927 - 1950 Hudson Numerical Parts Interchangeability Record. This part number fit all these years or models. 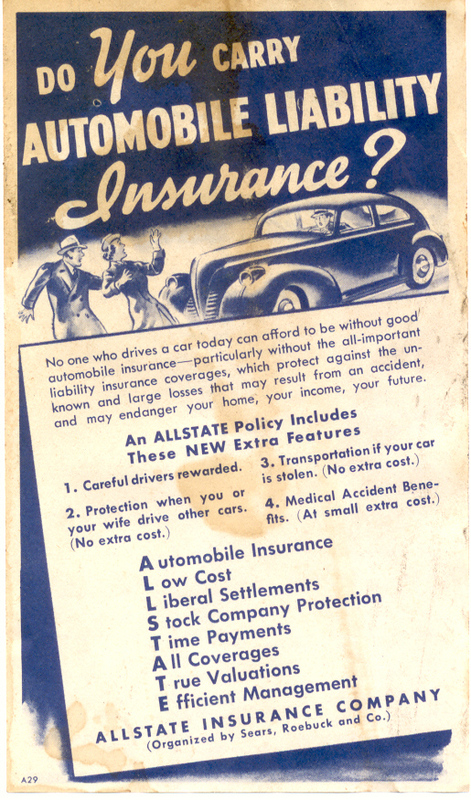 1932 Hudson, Essex and Terraplane Dealer bulletins. Radio, trunk equip, shocks, Carter carb. 1934 Servicing the 6 Cylinder Terraplane Engine for Models "K" and "KU"
1946 Looking Ahead. How To Sell 47, 48 49 50 Hudsons. 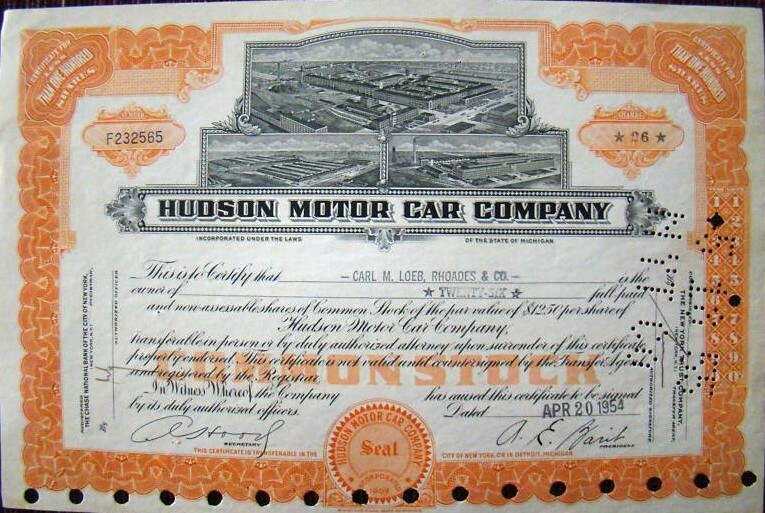 1929 - 1956 Hudson Engine Codes. 1940 - 1954 Basic Electrical Trouble Shooting by Lew Bird. Another WTN Article listing 1969 to 2009. The dash signal (idiot) lights consist of a Battery Charge Tell-tale and Oil Pressure Tell-tale on the instrument panel which are used instead of gauges to indicate when generator is charging battery and if oil pressure is satisfactory. They are regular lamp bulbs connected to the accessory terminal of the ignition switch (operative only with ignition switch turned 'on') and are controlled by the generator cutout relay and oil line check-valve as described below. 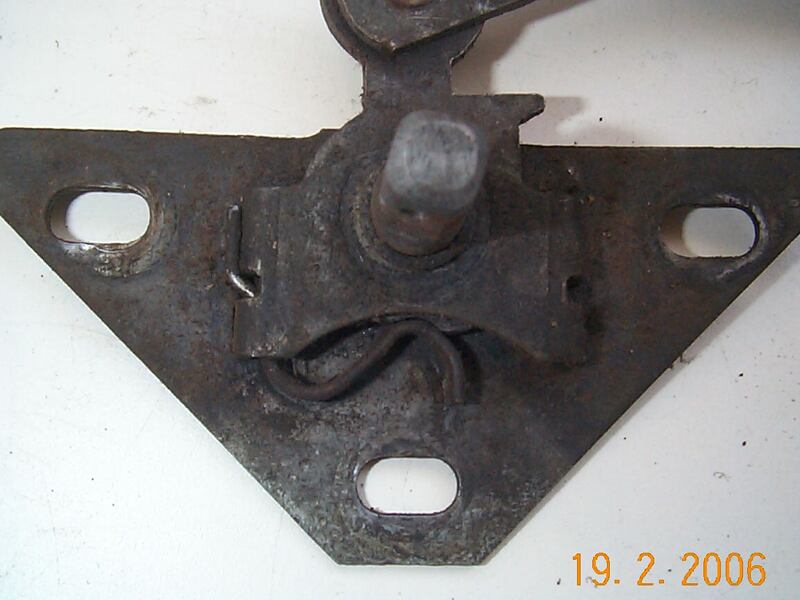 GENERATOR CHARGE TELL-TALE: - The cutout relay is provided with an extra set of ground contacts above the armature and the tell-tale lamp lead is connected to this contact "T" terminal on the regulator case. The lamp circuit is completed to ground through these contacts. 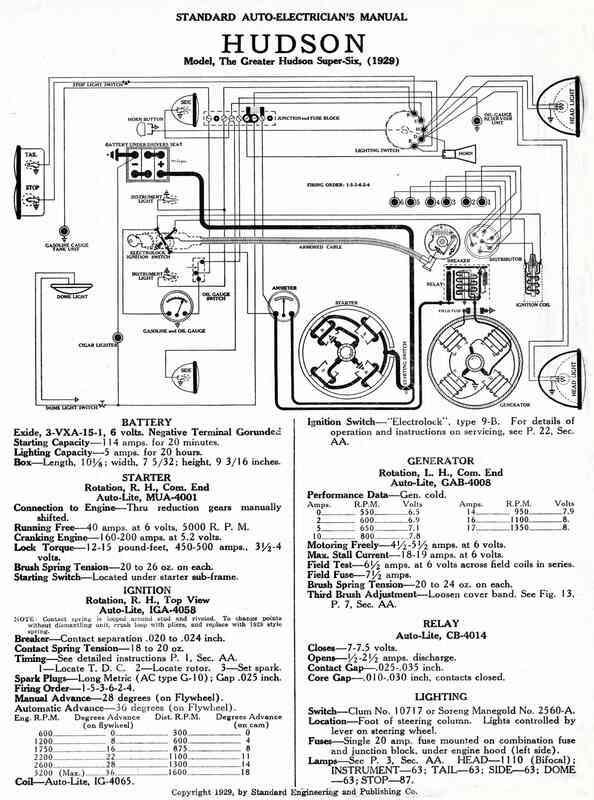 See car wiring diagram or model page for complete wiring circuits. Operation: - The ground contacts are normally closed with the main contacts open and open when the main contacts close. When the ignition is turned on, the tell-tale lamp lights and remains lighted until the main contacts close and the generator begins to charge the battery. The lamp should remain lighted after the car speed Is brought up beyond the cut-in point (approximately 7 MPH). OIL PRESSURE TELL-TALE: - The oil line check valve on the right side of the crankcase is provided with an insulated terminal pin which is grounded by the check-valve plunger when no pressure exists in the oil line. The pressure tell-tale lamp lead is connected to this terminal. A small hole in the check-valve plunger and a by-pass In the body allow the passage of sufficient oil so that the plunger alternately opens and closes the circuit at idling speeds, causing the tell-tale lamp to flash. Operation: - The plunger rests normally against the pin when no pressure exists in the oil line so that the tell-tale lamp will light when the ignition Is turned on. At idling speeds the plunger alternately opens and closes the circuit so that tell-tale lamp flashes. At speeds above idling (approximately 7 M.P.H. ), the oil pressure holds the check-valve plunger off its seat so that the tell-tale lamp does not burn or flash. Trouble Shooting: - If the tell-tale lamp does not light when the ignition is turned on, ground check-valve terminal to engine. If lamp does not light, replace bulb. If lamp does light, remove terminal pin and see that it is straight and clean. Take off plug on top of check-valve housing, remove plunger and see that it is clean and moves freely up and down. Examine spring above plunger. If tell-tale lamp does not flash at Idling speeds, see that small hole in plunger is clean and open. 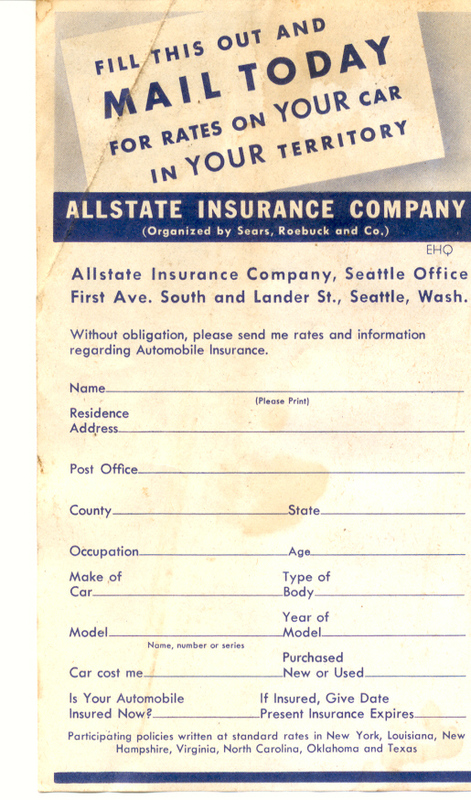 The 37 Flat Back sedan trunk lid will fit on a 38. The Hump trunks are all different 36, 37, 38.